Landesausbau describes medieval settlement and cultivation processes in regions of Western Europe that were previously only sparsely populated or uninhabitable. By means of clearing of woods and drainage of wetlands, new agricultural areas as well as new settlement areas were created. These processes of population expansion and resettlement let to an exchange of cultures and cultural diversity of languages, traditions and lifestyles. The Landesausbau changed the natural and cultural landscapes of Western Europe and has an impact until today. The terminology “inland colonization“ to describe the Landesausbau raises controversies between historians due to the linguistic parallelism to modern colonialism. After an early phase of Landesausbau at the end of the 7th century, the land expansion and the establishment of new settlements increased from the 10th century onwards and reached its peak at the 12th century. It came to a halt at the 14th century due to natural catastrophes, the outbreak of the pest and other crises that caused a steep decline in population. As part of the Landesausbau in High Middle Ages, the Eastern Settlement of peasants, craftsmen and merchants crossing the Eastern borders of the Holy Roman Empire to the Finnish Sea Bus, the Black Sea and the Sava, took place. At the same time, the Normans settled in England and South Italy and the crusaders expanded to the Iberian Peninsula. During the intense phase of Landesausbau, the settled and cultivated area increased by a third. In this context, it has to be emphasized, that the cultivation and settlement processes were carried out by a multitude of ethnic groups and in a majority of cases peaceful on the initiative of landowners and landlords. For example, the settlement east of Elbe and Saale at the 12th century involved not only Germans, the so-called ″coloni Theutonici″, but also Slavs, Flemish, Danish and other ethnic groups. Most settlement processes were peaceful. The cause of the Landesausbau involves a combination of several factors. Reasons include a moderate climate known as the Medieval warm period that occurred from about 950 until 1250. This warm period resulted in a greater exploitation of the natural resources and in longer and more productive growing season. At the same time, technological breakthroughs such as better harnessing material including whippletrees, traces, tribles[further explanation needed] as well as dyke and mill constructions went parallel with improved cultivation methods including selective cropping and grazing as well as crop rotation ( the so-called three-field-rotation). They improved the supply of the population with food. The population of Europe increased significantly at the High Middle Ages whereas an extensive almost-deserted fallow land of forests and marshes was not cleared. Around 1300, the population of Europe is estimated to have reached a peak of as many as 70 million and population density reached a peak with over 20 inhabitants per km2: The clearing of woods and drainage of wetlands for the creation of new settlement and cultivation areas became a necessity. The Landesausbau can also be seen in relation to the changing social pattern. The spread of a new money system since the 12th century, the birth of towns with market privileges, the creation of new long-distant trade routes until the Netherlands and the Lombardy, and intensive commercial relations increased to a high degree the mobility of merchants and craftmen. Those merchants and craftmen were attracted by privileges such as guaranteed free trade and the heritable, interest-free ownership of their enclosed domicile to urban centres. At the same time, feudalistic structures weakened and with it, the bonds of serfdom that tied peasants to the lands diminished. The greater mobility contributed to the resettlement of the population especially during High Middle Ages. ^ Piskorski, Jan M. (2002). THistoriographical Approaches to Medieval Colonization of East Central Europe. A Comparative Analysis against the Background of other European Inter-Ethnic Colonization Processes in the Middle Ages. Boulder. ^ Biermann, Felix; Mangelsdorf, Günter (2005). Die bäuerliche Ostsiedlung des Mittelalters in Nordostdeutschland. Untersuchungen zum Landesausbau des 12. bis 14. Jahrhunderts im ländlichen Raum [The Eastern Settlement in Northern GErmany during Middle AGes. Research on the Landesausbau of the 12th and 14th century] (in German). Greifswalder Mitteilungen. ^ Gringmuth-Dallmer, Eike (2006). Die hochmittelalterliche Ostsiedlung in vergleichender Sicht. In: Siedlungsforschung 24 [A comparative analysis of the high-medieval Eastern settlement In: History of settlement 24page=99-121] (in German). ^ Ladurie, Emmanuel Le Roy (1971). Times of Feast, Times of Famine: a History of Climate Since the Year 1000. Farrar Straus & Giroux. ^ Alberth, John (2013). An Environmental History of the Middle Ages: The Crucible of Nature. Routledge. ^ Russell, Josiah C. (1972). "Population in Europe". In Cipolla, Carlo M. (ed.). 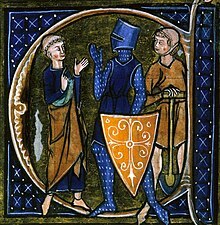 The Middle Ages. The Fontana Economic History of Europe. 1. Collins/Fontana. pp. 25–71. ^ Lopez, Roberto S. (1967). The commercial Revolution of the Middle Ages, 950-1350. Cambridge University Press. ^ Blair, John (1991). English Medieval Industries: Craftsmen, Techniques, Products. Hambledon Press. This page was last edited on 27 August 2018, at 21:56 (UTC).